Preparation time: 5 minutes. Baking time: 45 minutes. Preheat oven to 350°F. Wash and dry plantains. Trim off both ends of each plantain. Make a slit in the peel of the plantain lengthwise. Place on a baking sheet and bake for approximately 45 minutes (turning over halfway through the baking), until plantain flesh is tender. 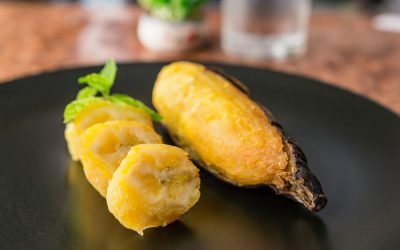 Slice each plantain into 3 equal-sized pieces and serve in skin.